Last year I attended Mixed Conference where I got to meet Duff Goldman and work on decorating a cake with fondant. I also got some fondant to take home with me. Over the past year I’ve made several cakes where I’ve cut out pieces of fondant to stick to the cake but I hadn’t yet decorated an entire cake with fondant…until now. My friend Tina was turning 50 a few weeks ago and she asked if I would make her cake. I was happy to help her out with a cake and when I asked what she wanted she told me something hot pink, fun, and full of bling. 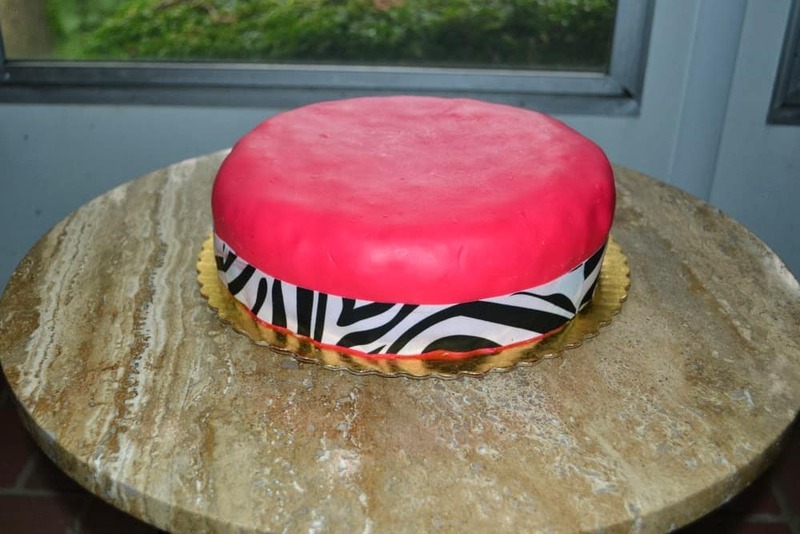 I went in search of a cake that would fit her style and decided to make a hot pink cake with zebra stripe and a fondant high heel. She loved the ideas and I started sketching out ideas. 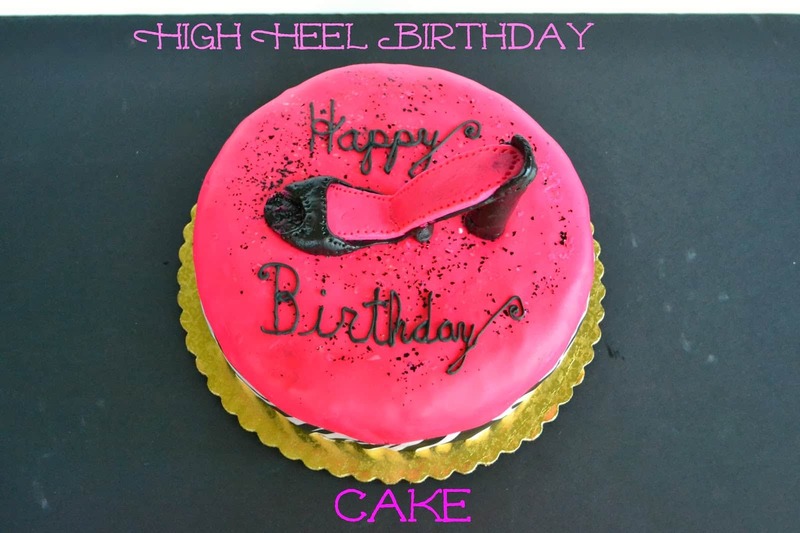 I was super worried about the fondant high heel. I wasn’t sure how it was going to turn it. I made it several days in advance and then stored it in an air tight container so it would firm up. While it was delicate, it held together and looked awesome! I was so pleased with the cake and Tina seemed to love it as well. 1. Preheat the oven to 350 degrees. 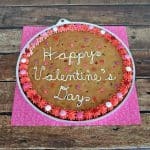 Line the bottom of two 9 x 2 inch round cake pans with parchment paper. 2. In a medium bowl whisk together the milk, egg, and egg whites. Set aside. 3. In another medium bowl combine the flour, baking powder, and salt. Set aside. 4. In the bowl of a stand mixer combine the sugar and butter. Beat on medium speed for 3 minutes or until the butter mixture is light and fluffy. Mix in the vanilla. Cut the vanilla bean lengthwise and scrape the beans into the mixture. Mix to combine. 5. Add one third of the flour mixture to the bowl and beat on medium speed. Continue mixing while adding in half of the milk mixture. Then beat in half of the remaining flour mixture. Mix on medium for 1 minute. 6. Add in the remaining milk mixture, mixing until it is well incorporated. Finish off by adding the remaining flour mixture and beat for 2 minutes. 7. Divide the batter into the two prepared cake pans and bake for 30-35 minutes or until the cakes are springy to the touch and a toothpick inserted into the center comes out clean. 8. Allow the cakes to cool in their pans for 5 minutes before running a butter knife around the edges and unmolding them. Remove the parchment paper from the bottoms and turn them right side up on a wire rack. Allow to cool completely. 9. In a bowl combine the butter, coconut milk, and vanilla. Beat with a mixer until smooth. Add in the powdered sugar and mix well. Add in half the coconut flakes and mix until just combined. 10. To assemble the cake place one of the cakes on a cake round. Spread a half cup of frosting over top of the cake and sprinkle with coconut flakes. Top with the remaining cake. Frost the top and sides of the cake with the remaining frosting. 11. 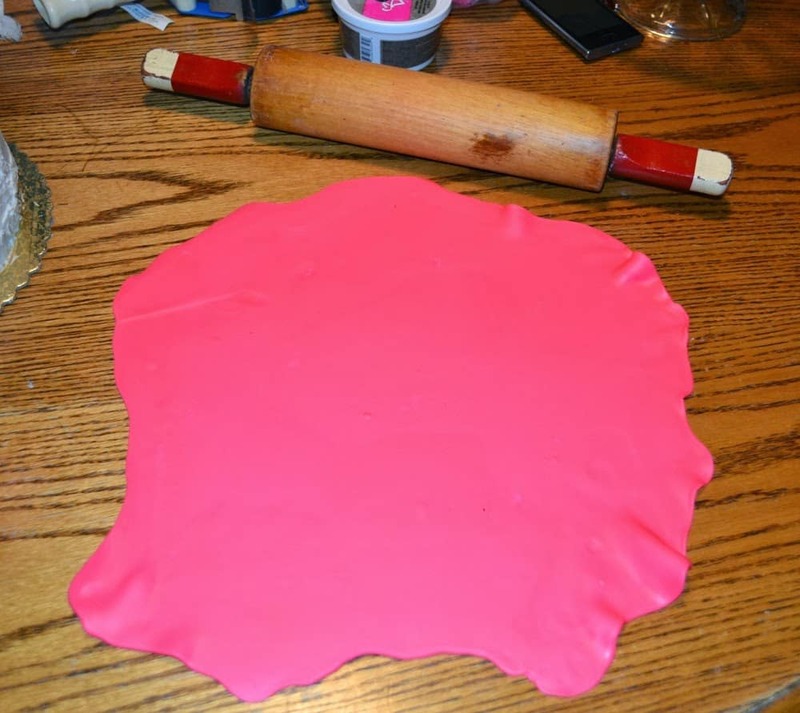 Take 8 ounces of the hot pink fondant and work it in your hands until it is pliable. Using a rolling pin, roll it into a circle big enough to fit over top of the cake. Carefully roll the fondant onto the rolling pin and drape over top of the cake. 12. Carefully smooth the fondant onto the cake, taking care with the bottom. Trim any excess fondant. 13. Cut the zebra sugar sheet about 1 1/2 inches wide and long enough to fit around the cake. Rub a small amount of water on the sugar sheet and wrap around the base of the cake. Smooth the sugar sheet into place. Place in a cake dome until ready to top with the high heel. 14. 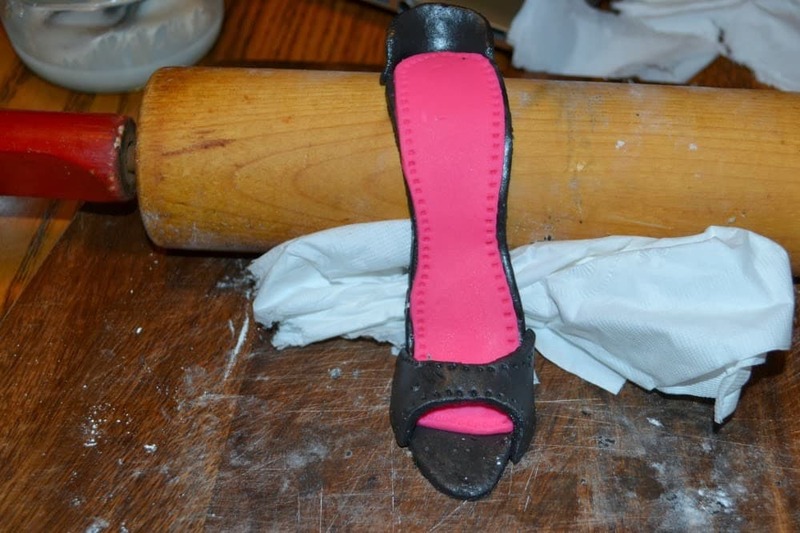 To make the high heel work a 4 oz piece of black fondant until it is pliable. Roll to 3 mm thickness. 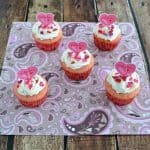 Do the same with a 2 oz piece of hot pink fondant. 15. Cut the black fondant in half. Place the pink fondant gently on top of the black fondant. Using a sharp knife cut out a high heel shape. (Click Here for patterns). 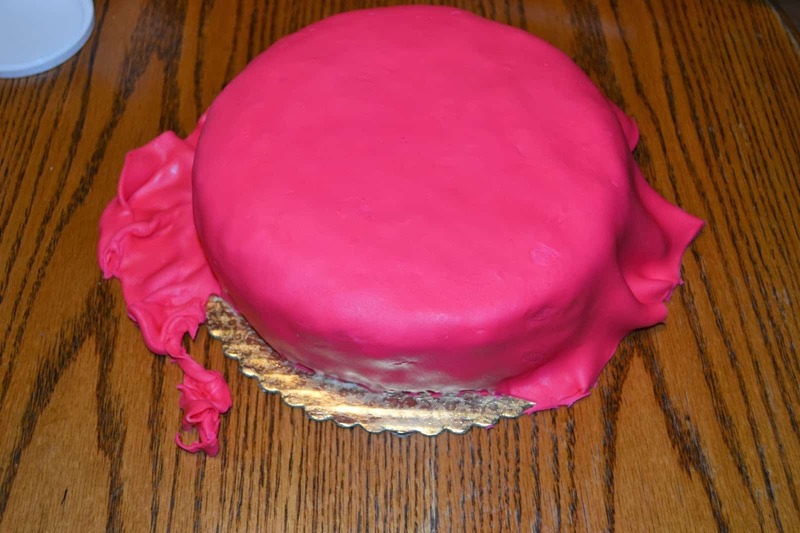 Remove the pink fondant from the black and cut off the “toes”. You will also want to cut 1-2 mm off the entire pattern. This will be the insole. 16. Using a toothpick, gently poke holes around the outline of the pink insole to create stitching. 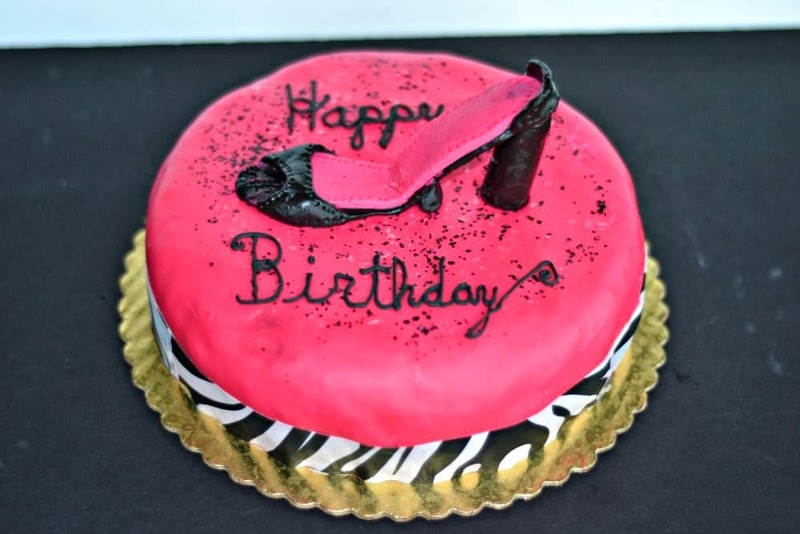 Brush the black high heel with royal icing and gently press the pink insole on top of it. 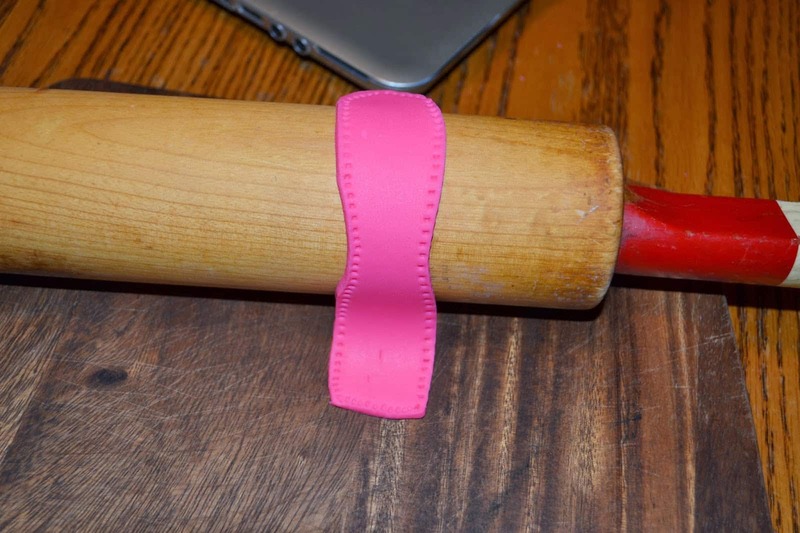 Using a rolling pin, shape the fondant into a high heel with the toes on the ground and the heel on the rolling pin supporting it. 17. Cut out a semi-circle to fit on the back of the shoe. Use the toothpick to again make the stitching. Using royal icing, glue the back onto the shoe. 18. 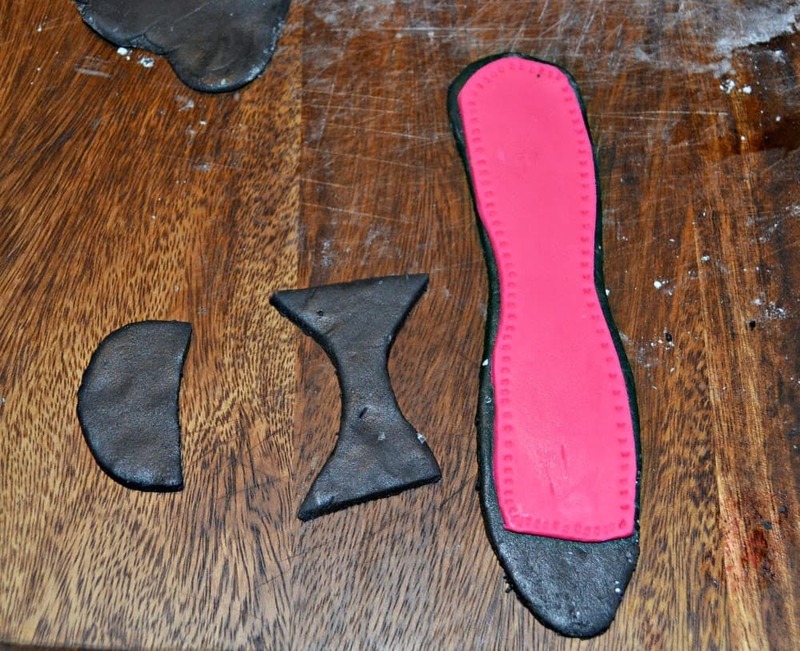 Cut a bowtie shape out of the black fondant for the to of the shoe. Use the toothpick to make the stitching. Use royal icing to glue it on. I stuffed a paper towel under this piece to support it and help keep the shape. Allow the high heel to dry for at least 12 hours. DO NOT refrigerate! 19. At this point, measure how tall the high heel is. Break a pretzel rod to slightly under the height of the high heel. Roll out a piece of black fondant and cover the pretzel rod with the fondant. Gently smooth the fondant so fingerprints don’t show. You will want the top to have a thicker, flat surface. The bottom should taper. Using royal icing, attach the heel to the shoe, removing the rolling pin support. 20. 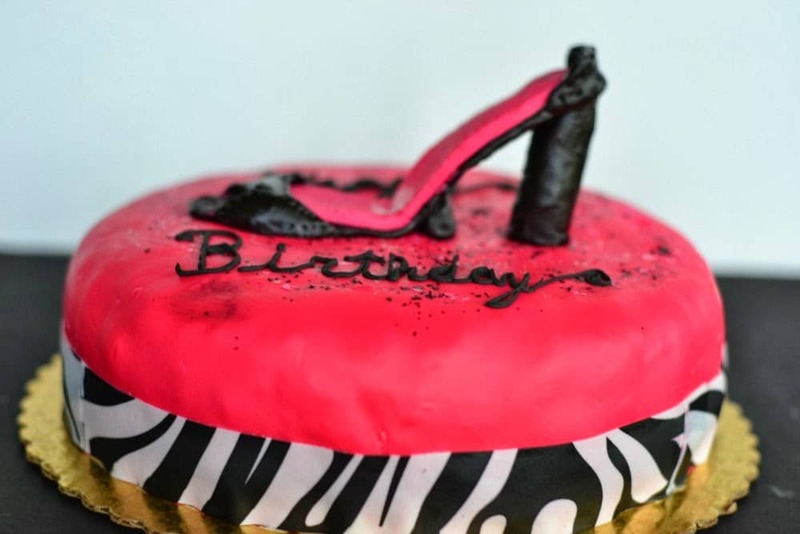 Gently set the high heel on top of the cake, making sure the heel is positioned to hold the shoe. Sprinkle the cake with black glitter. Pipe on a message with the black frosting. 21. 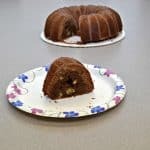 Keep in an air tight cake carrier until ready to serve. So cool that you worked with fondant! I love vanilla and coconut cakes! 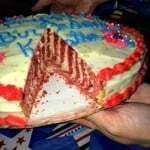 Totally cool cake – pinned! Thank you! It took some practice but I think the next time I do it, it’ll be much easier! Thank you! It was for a 50th birthday party and the woman loved it! I have never used fondant! You make it look so easy! Love the shoe!